Thomas E. Heslin became executive editor of the Providence Journal in November 2008. Prior to that, he was the managing editor for new media with responsibility for projo.com’s online news initiatives. During that time, The Journal’s Web site, projo.com, was acknowledged for excellence and innovation by the Associated Press Managing Editors, the Newspaper Association of America, the New England Associated Press News Executives and Editor & Publisher magazine. Heslin helped to found the New England First Amendment Coalition and ACCESS/RI, regional and state non-profit organizations dedicated to improving public awareness and access to the records and processes of government. 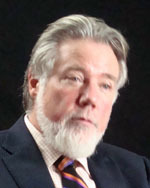 He has served on the board of the national Freedom of Information Coalition, the Freedom of Information Committee of the American Society of Newspaper Editors, and as a New England coordinator for the American Society of Newspaper Editors’ Sunshine Week project on open government and freedom of information issues. Tom Heslin, Sr. V.P. & executive editor, The Providence Journal, says, “we do not use anonymous sources … and that has helped our reporting and our credibility.” In contrast to many Internet blogs that practice “the journalism of assertion,” Heslin says The Journal practices “the journalism of verification” – checking its facts and seeking balance before it publishes the news. Tom Heslin, Sr. V.P. & executive editor, The Providence Journal, says despite all the recent changes in newspapers, newsrooms are “still at the dawn of transformation,” like television in its early days when it mimicked radio. He says The Journal is in “a battle for people’s discretionary time” and that there are many new media players in that skirmish.